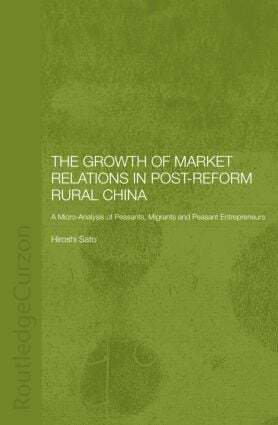 This book, based on in-depth field research at the local level, assesses the different factors that are contributing to the transition to a market economy and the growth of networks in rural China. It analyses the different socio-economic actors - peasant households, out-migrants, family businesses and peasant entrepreneurs, uses the key concept of markets as a nexus of social networks, and identifies three different kinds of 'social capital' - human capital, political capital/status, and network capital. This book demonstrates the importance of socio-political networks and highlights significant regional differences. Hiroshi Sato is Professor of Chinese Economy and Society at the Graduate School of Economics, Hitotsubashi University, Tokyo, Japan. His research interests are economic and social behaviour of household, labour market formation, distribution of household incomde, and poverty alleviation. The primary aim of this series is to publish original, high quality, research-level work, by both new and established scholars in the West and East, on all aspects of the Chinese economy, including studies of business and economic history. Works of synthesis, reference books and edited collections will also be considered. Submissions from prospective authors are welcomed.